An important thing to remember when using TrustedHousesitters and planning your housesits is the actual location. For the security of the homeowners, exact addresses are not provided on their listings. Generally, the closest city or town is used as the location. This is also how Airbnb and other similar sites work. However, you have to remember that a home can be only three miles from town, but maybe there is no public transport there at all! Asking about exact locations is really important before you commit, especially if you do not have a car and will have to rely on public buses or trains. Some homeowners will let you use their cars while they are away. This varies greatly and is often dependent upon insurance options, so don’t rely on this as a definitive option! Housesitting in Edinburgh could actually include a wide range of locations, many of which are not within the city limits themselves. If your plans include checking out the tourist attractions and experiencing the city, you certainly want to check with the homeowners regarding the distance from home. Keep in mind that your priority is to care for the pets and home, with your own adventures being secondary! But, of course, it’s nice to actually explore a new area and that is part of the understanding when homeowners get free housesitting services. If you’re taking care of cats, you generally have more time to wander from the home, while dogs typically require more consistent care. Be sure to be very honest about your plans and your ability to be inside the home or not! Communicating openly and honestly from the onset is vitally important for everyone’s benefit. So, enough about the logistics, now on to our experiences housesitting in Edinburgh recently! Portobello is the seaside part of Edinburgh that was very popular in the mid-20th Century and still attracts quite a crowd on those elusively sunny summer days. We, however, were in Portobello during the middle of winter! Alas, the Scots are not a meek folk, so even on blustery, freezing cold days, you’ll find folks walking along the beach and even enjoying a cup of tea al fresco. Our catsit included two adorable and snuggly little moggies (a common term for cats here, I’ve learned) named Missy and Merlin. Missy is getting on in years and needed a little extra medical attention and love, but she handled it so well and returned our affections so sweetly. That’s an important consideration when you’re caring for other people’s furry family. Do you feel comfortable giving medications? Make sure you understand what’s involved before a homeowner leaves and never be afraid to ask for clarification. Mr. Merlin provided our entertainment! He preferred to offer a headbutt as a greeting and enjoyed trotting outside to scale the garden walls and survey his kingdom. Combined, they kept us smiling and warm even during one of the area’s worst snowstorms. The Menagerie! These four were so stinkin’ precious and we were lucky enough to return for a second sit a few months later. Two labradors and two sister kitties and all four had personalities to boot! The location of this sit was New Town, right in the heart of Edinburgh and with access to some of the private New Town gardens. This area of the city was well-planned and included many green spaces for the wealthy residents to enjoy. They remain gated today, with only residents retaining keys to access them. As we were temporary residents, we made sure to enjoy as many of these special spaces as possible! Being in the heart of the city allowed us to get out and about much more often, even though we never left the dogs alone for more than a few hours at a time. An advantage to housesitting more locally is that you can help out a homeowner for last-minute needs. One lovely lady had a last-minute long weekend trip and needed someone to look after her husky. She was well outside of city center, but thankfully the public transport options here are exceptional, so I had no trouble at all taking the bus to her house. I spent a few days singing along with Mr. B’s husky songs and he had a whale of a time in his natural element when a second big snowstorm came through the area. If this had been a longer sit, I might have felt a little too isolated, but a few days to hang out and help her out were absolutely fine! Another housesit also took us outside of city center, but into a beautiful residential area close to very good friends of ours. This combination was ideal! I had lovely parks to walk the two (and sometimes three) pups nearby, but plenty of peace and quiet to get some work done during the day. And we even joined up for a wonderful walk with our friends and their pup, too! With this sit, the homeowner asked us if we’d feel comfortable also walking her son’s dog occasionally when he had long shifts at work. Three dogs seemed a bit daunting to me at first, since I would primarily be walking them alone, but she assured me that all three were easy and had excellent recall, so I gambled. And I’m so glad I did! Not only did we end up with a lovely third pup for a few of our days there, but we also got to meet her son and daughter-in-law, who also invited us over for a fabulous dinner at their house. House and pet sitting has offered us the chance to snuggle lots of animals, but also to meet some extraordinary people along the way. These folks were such a wonderful family and we felt so welcomed! This is my favorite part of traveling with TrustedHousesitters, since travel all too often means little contact with locals outside of basic tourist interactions. We have shared meals with homeowners in France, Ireland, Scotland, London, and Spain. We have been welcomed with open arms into homes that offer a glimpse into local life. It’s truly been such a fabulous experience! After traipsing around London all summer and then gallivanting off to Spain for three months, we returned to Scotland for a two-week housesit with a shy cat on castle grounds. Yes, castle. Because this is Scotland so that’s considered to be normal! This sit was listed as Linlithgow, which has a train station with easy access into Edinburgh. However, this lovely castle estate was nowhere within walking distance of public transport, so it was vital that we had a car. It didn’t bother me at all – being at the house more meant I had more time to win over our hesitant kitty…who became my lapcat coworker in no time at all! This was the first time these particular homeowners had used TrustedHousesitters, so they were a bit unsure about the process. I think they felt much better meeting us in person before the sit so they had a better idea for who was in their home. We overlapped a full day and night with them before they left, which was a great chance to get to know each other and to assuage any concerns they might have had. Luckily for us, they are a fantastic couple and we had such a blast hanging out with them that we didn’t even want them to leave on holiday! 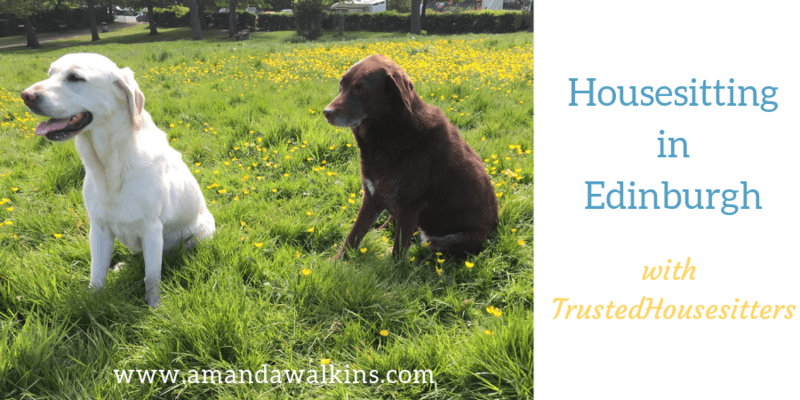 These were just our recent experiences with house and pet sitting in and around Edinburgh last year. We have enjoyed these experiences immensely! We’ve met some wonderful people, we’ve spent time with such precious cats and dogs, and we’ve lived in a wide variety of homes. We’ve been so lucky to have had homeowners welcome us into their lives and to have been adopted by so many loving cats and dogs last year…it’s been such a treat! If you’re considering housesitting with TrustedHousesitters, feel free to reach out with any questions or concerns you may have. I’m always happy to help and to share our experiences. Website Disclosure: Links on this site may be affiliate links, which means I receive a commission if you click and purchase anything. It adds no cost to you, but it helps me pay my bills. Apparently, you can’t trade coconuts or banter for electricity…it’s most unfortunate. For more details on how affiliate links work, click here. If you’re new here, feel free to check out my many former homes in Honduras, Ecuador, Spain, Scotland, Ireland, and the Mediterranean island of Malta. You can follow along on our adventures by subscribing to my newsletter below, and join me on social media, too! I’m on Facebook, Instagram, Twitter, and Pinterest. See you there!